A check for $400.00 was presented to Betsy Sethares from the Cape Cod Times Needy Fund. Students improved literacy and math through experiential learning with a focus on the social curriculum and values. Second graders at the Wing School investigated charitable organizations and selected two, IFAW and the Cape Cod Times Needy Fund. They relaimed paper and other materials, then made, advertised and sold unique, spiral-bound blank journals. They learned about themselves in the process and felt good about giving their time and money to others in need. Seven boys and girls ranging form age 7 to age 12 collected unwanted papers, sorted and arranged them, then bound the assortment of papers, envelopes and more into blank journals with huge child appeal. They sold the books for $10. apiece at local stores. As a group, they researched charities and each presented information about their cause to the others. Through a surprisingly complex, student structured voting process, they agreed to give their money to two different charities that help animals. 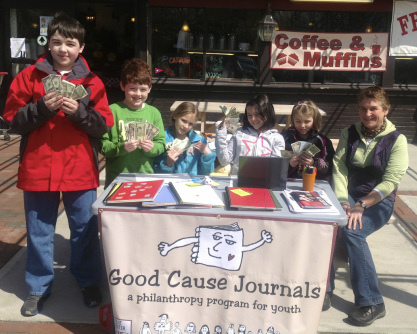 As part of this program, the children discussed the reasons why people give their money and time to others. They discovered that doing good work to benefit people or animals in need makes the givers feel really good. Ella, Emily, Kailey, Patrick, Rachel, Sydney and Tim felt very good about donating $300.00 each to the MSPCA and IFAW.